Between all the free Nook book deals and the ebooks I receive for review, I had not actually purchased an ebook for my Nook. Until Earth Angel. I had won a copy of Boyfriend from Hell last year and enjoyed the start of the series. After seeing the tweets about it being released, I decided I enjoyed the first book enough to want to know what happens next. I think I liked Earth Angel a bit more than Boyfriend from Hell. Maybe because it focused more around Megan and school that I could get more into the young adult aspect of it. In my review of Boyfriend from Hell, I mentioned I related more to the mom. 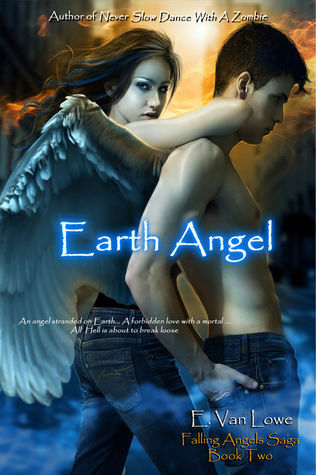 And as teen paranormal fiction goes, Earth Angel is pretty darn good. There were a couple of bumps in the road for me. (I think he takes more of a Judeo Mysticism approach to God and Angels, than my Christian background allows for). But it didn't deter me from reading, if anything it made it more fun as I debated with myself free will, power of faith, etc. Someone without my background, probably won't even notice these points as they are pretty common in secular books. While I was reading this book, my Mom substituted in a class where a girl was trying to find books similar to Twilight to read. Of course, Mom asked me what to recommend. Paranormal romance is not really my genre and I think Twilight is the only series I have ever read with a vampire in it (Oh, I take that back Immortal by Gene Doucette has a vampire, but it's not the same). I thought about it and then when I picked up Earth Angel that evening (yes, I broke my rule of only reading ebooks when out & about) and saw the appeal it would have to the Twilight crowd. Guy is the perfect other worldly being that teen girls will swoon over. Though there is a lot more realism to him than Edward Cullen. I guess you could say he is softer around the edges, too. Megan is the typical teenager: not Miss Popular, but not really Miss Geek either. She is intelligent and likeable. I see a lot of my teenage self in her. Thanks for adding me to your Circles. I'll stop in to say hi and read your reviews.